One of the lesser-known qualities of glass is that it can serve as a sensor for detecting and measuring gamma radiation. Gamma rays are energetic enough to create color centers, or pointlike defects, in glass; monitoring the optical transmission of the glass is a straightforward way to determine how much gamma radiation it has received. 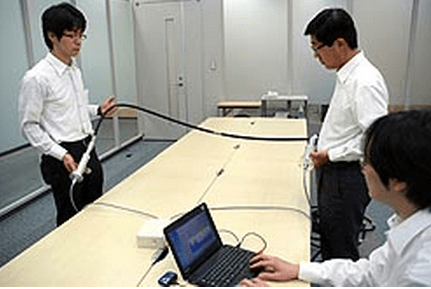 Hitachi-GE Nuclear Energy has developed a system to measure gamma dose rate in air using optical fiber that emits light in response to radiation. The system consists of a plastic scintillation fiber that responds to radiation, light detection unit, signal processing unit and other components. It operates four hours continuously with a rechargeable battery. It will sell the system through Techno AP, a dosimeter vendor, and a group company will use the system to start radiation measurement services. In decontamination work related to the Fukushima accident, air dose rates are measured before and after decontamination to evaluate improvement. Survey meters, which are widely used for air dose rate measurement, only allow pinpoint measurement, so that they require a huge amount of time to survey a wide area. The measurement system can measure the average gamma dose rate in air around the optical fiber as far as 20 meters in a few seconds. It can also measure the distribution of air dose rate at every 10 centimeter interval in a few minutes. The system can detect “hot spots” that may be undetected by survey meters and can also be used in water. Because glass can be used as a radiation detector, its potential benefit to facilities that may have areas of hazardous radiation, such as nuclear-waste storage sites and nuclear reactors, can be great. In the form of an optical fiber routed throughout a facility, glass can serve as a remote distributed radiation sensor that can be easily queried by monitoring its transmission. Radiation induced effects in materials and devices are evaluated based on the energy losses resulting upon the interaction between highly energetic radiation and matter. The efficiency of coupling to and detecting the Cerenkov radiation with an optical fiber is a function of the type of optical fiber (its refractive index), the particles energy, the irradiation geometry: angle of incidence of the particle beam on the optical fiber axis, the optical fiber NA, the distance between the particle trajectory and the optical fiber axis. Gamma-rays can lead to the generation of Cerenkov radiation only if a Compton converter target is placed between the gamma source and the optical fiber. Photons incident on the converter produce electrons through the Compton Effect, with electrons further used to generate Cerenkov radiation. The efficiency of the conversion from gamma-ray to optical radiation depends on the target material (the best one proved to be beryllium), its thickness, the distance between the target and the optical fiber, the type of optical fiber, the angle between the gamma-ray trajectory and the optical fiber axis, the energy of the gamma-ray . Generically, the term highly energetic radiation covers: a) uncharged particles – photons (gamma-rays, X-rays); b) charged light (electrons, positrons) and heavy (different types of ions) particles; c) nucleus constituents (neutrons, protons). Accelerated alpha particles (two protons and two neutrons bounded) or electrons, as well as high energy neutrons or photons can produce an atom’s ionization.